Zach Phillips—one half of the Brattleboro, Vermont duo Blanche Blanche Blanche—might be equally as well known for his involvement in the band as his elongated and hyper-intellectual musings on music aesthetics and music criticism. Reading Phillips’ writing is like wading through highly complex critical theory replete with references to obscure recording artists and an arsenal of psychoanalytic vocabulary. Blanche Blanche Blanche’ s music is similar in tone: off-kilter and esoteric. The duo, made up of Phillips and Sarah Smith, deconstruct pop music to its very strange, cynical core. There’s something dark and unsettling about a lot of pop, and the duo’s intentional use of dissonance and “unagreeable” harmonic structure frames what are essentially pop songs with a psychedelic sensibility akin to a bad acid trip at worst, transcendence at best. 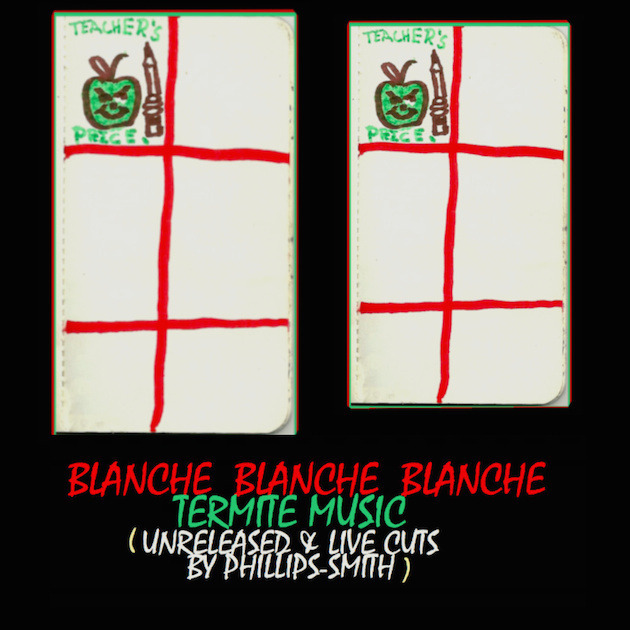 The band’s newest release, Termite Music, isn’t actually new at all; rather, it is a collection of live and unreleased Blanche Blanche Blanche songs in all its manifestations (different line-ups are listed at the bottom of the Bandcamp page). “Collection” might be an understatement, though. There are sixty tracks on Termite Music, and that adds up to over 110 minutes of the breed of pop devolution that only Blanche Blanche Blanche can construct. Termite Music is out now digitally and on cassette via Phillips’ OSR Tapes label.